Last year, I applied the accuracy scoring metric utilized by the Stassen Preseason Poll (preseason.stassen.com) to my own conference predictions. My projections had the same point total as the first place finisher, the Compughter Ratings, putting me ahead of all the preseason magazine publishers for the 2011 season, including Phil Steele, Athlon, Lindy’s, etc. So what did I do after having such a good year? I went to work revamping all my prediction techniques and developed some innovative, unique modeling methods along the way. I logged countless hours, collected new types of data, simulated historical seasons, and significantly improved my procedures. My 2012 conference predictions are presented below. Estimated probabilities of winning the conference or reaching the conference championship game (where applicable) are included, which I believe is a fairly unique feature, certainly not available in the preseason magazines. It allows you to see which conference and divisional races figure to be tight (e.g. 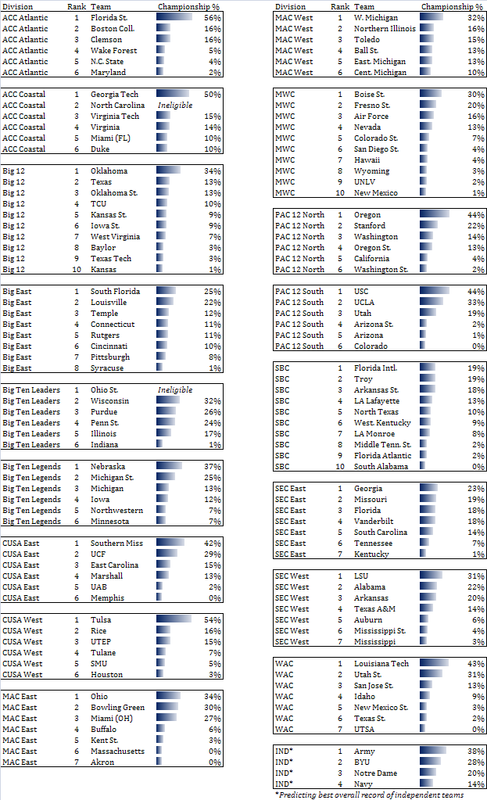 SEC East, SBC) or where one team has a huge advantage (e.g. ACC Atlantic, Big 12). Note: I’ve projected divisional finishes for Ohio State and North Carolina, but both are ineligible from their respective conference championship games, so I noted that in the corresponding tables. The projections for the Indepedents are based on expected final record, since they don’t have a conference affiliation.